When I first received a kilo of this very special peppercorn as a gift from a business associate I loved it right off the bat. Being a foodie my whole life I immediately filled all my peppermills at home with this extraordinary product. What I didn't expect was the reaction I had from guests in my home. As they ground the pepper I observed surprise, curiosity and pure pleasure as first the aroma and then the taste entered into their senses. "What kind of pepper is this? It smells and tastes so good" was the usual response. At this point I realized I had to inquire about importing this product. After extensive research I discovered that the pepper from Madagascar is the finest, most aromatic pepper in the world. I am now carrying a variety of sea salts from around the world and a special collection of dry rubs for grilling and roasting, as well as other gourmet products and gadgets from the Mediterranean region of France and Italy. 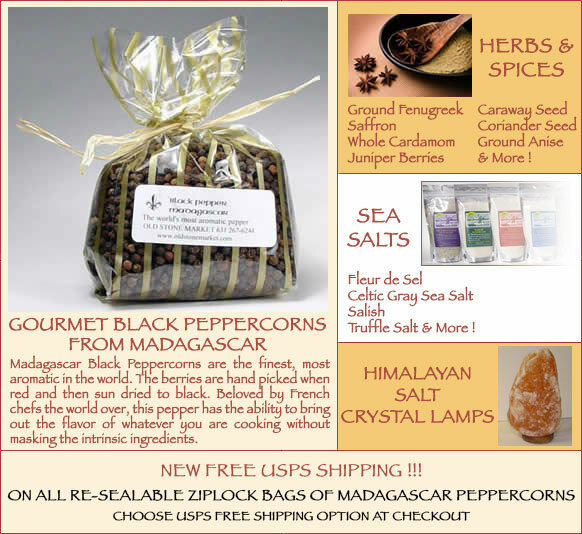 See our exciting 5 new infused sea salts. After a twenty year career as a French Bistro owner (Bistro du Nord, Le Bilboquet, Bar du Theatre) in New York City, I now operate Old Stone Market out of Harper, TX, where I have become known as a chef's resource.